In the first ever Charity Shield Final contested between two teams from the same club, it was Bylet B of Division 3, who prevailed over Bylet A of Division 1 in a closely fought match at SJB no.1 yesterday. 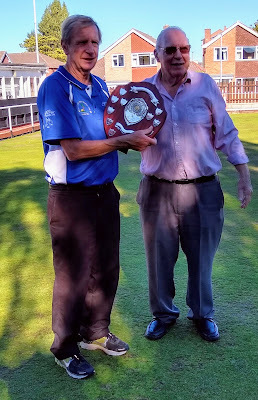 Bylet B Captain Geoff Carnell received the Charity Shield from acting League President John Ford. 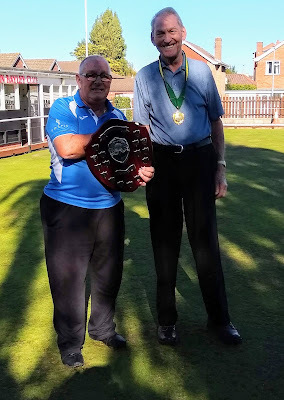 Bylet A Captain Russ Morris received the Runners-up shield from League Officer Ron Adams. 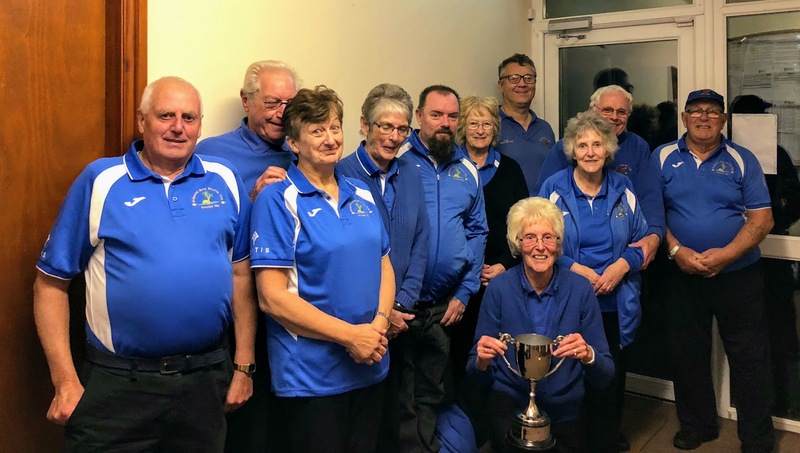 Congratulations to Jane Wherton and her Ludlow League team on winning the League Handicap Cup on Sunday 23rd September at Chelmarsh. In the semi-final Bylet beat Cleobury by 6 shots in what League Secretary Steve Burmingham called a 'shock victory' (Cleobury failing to overcome a -40 shot handicap). In the final Bylet overcame Bromfield by 86 shots making a bit of a mockery of their +106 shot handicap with excellent wins by Sue Corfield, Dave Durant, Fiona Hammond, Geoff Carnell & Neal McLachlan. Bylet's Cup Winning Team, L to R: Mick Corfield, Terry Hammond, Sue Corfield, Fiona Hammond, Neal McLachlan, Georgina Marsh, Paul Cordey, Sue King, Dave Durant & Geoff Carnell. Front: Captain Jane Wherton with the cup. Commiserations to Scott Harries and his team on their narrow defeat by Bowring in the Harris Cup Final at SJB last night. Scott received the Runners-up Shield from League Vice-Chairman Dave Evans. The Seniors Charity Cup final will be played on Thursday 27th September at SJB between Bylet A and Bylet B. 1.30pm start. Bylet will play Bowring in the Harris Cup Final on Saturday 22nd September at SJB, 6.30pm start. All support welcome. Congratulations to Cheryl Caswell on winning the President's Cup and Rob Renke for winning the Captain's Cup. More details here. Bylet will be sure of winning the Mid-Shropshire Seniors Charity Shield because both Bylet A (Division 1) and Bylet B (Division 3) have reached the final to be played on Thursday 27th September. In the semi-finals, the A side had a comfortable 26 shot victory with all six winners against Mortimer at Squirrel while the B side made full use of their +24 handicap to edge out Division 1 opponents White Horse HUSC by 1 shot at Shifnal. Well done to the Harris Cup squad on reaching the final with an overall 12 shot victory over Hadley United Services Club in the semi-final. Please support your team captains! Weather permitting, the greens will open on Tuesday 20th March. The Annual General Meeting will be held on Monday 12th February at 8pm in the club. Prospective new members are welcome to attend.